The other day I was spending some time visiting family and friends. We, like always, end up taking about the past; interesting stories and revisiting the good old advice that once or twice we might have received during our life. In this case it was very interesting to hear the following advice that was provided to my friend when he was promoted to a people manager role. He then started to explain that in groups, individuals can be identified by two general criteria, one being Smart or Dumb and the other Lazy or Hard Worker. He then started to explain that this was very important to understand since the cohesion of the group and the overall performance depended on being able to classify the individuals and being able to plot them in the following chart. Then he explained that you most likely will have people in all quadrants and understanding this is the very 1st part of the advice. This will become “key” during evaluating performance and generating the “List”. 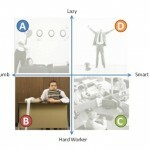 The second part will be how does affect your work and team performance. 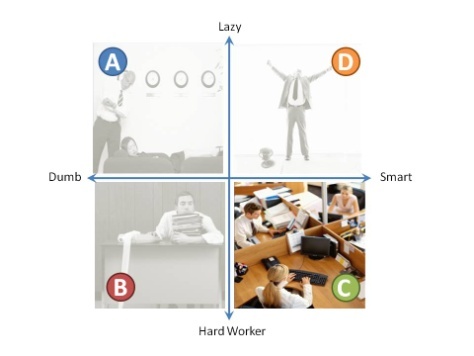 Lastly and more important is what to do with the individuals in each quadrant. need to do. The experience manager then explained that you need people like this in your group, at least one, preferably two. Here is what his strategic thinking comes into play. In very large organizations there is what is known as forced curve when it comes to ratings/rankings. This will force management to select the lowest performance to put in corrective action and sometimes to move out of the organization. That is the purpose of having and keeping these individuals in your group. 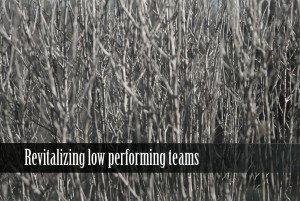 The argument here is that if all of your team are high performer and deserved to be on the top, but you are force to determine the lowest performer of your team and assigned a low performing rating, it will mean that the person most likely will be out of any type of compensation (monetary, salary increase, bonus, stockS, options) Even though the person performed as a top performer in comparison with others in other organizations. So, having one or two of this type will allow you without penalizing the actual hard workers conform to the rating/ranking distribution. 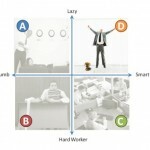 Now interesting enough, the next quadrant is one fill with controversy. 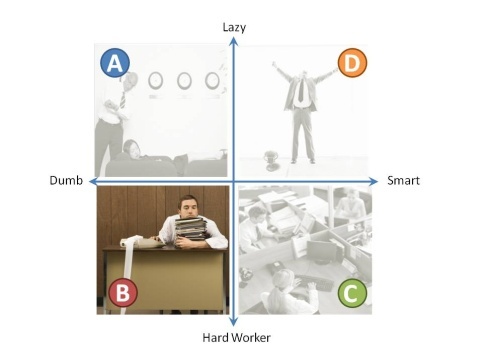 The Dumb but Hard Worker quadrant will be filled with the names of people in your team that are going to do more damage than good to the group. Here to my understanding from what I was able to capture, people in this quadrant are individuals that are very busy, busy doing things, busy creating work. Do not get me wrong, busy might not be in most cases a bad thing but in this case it is. 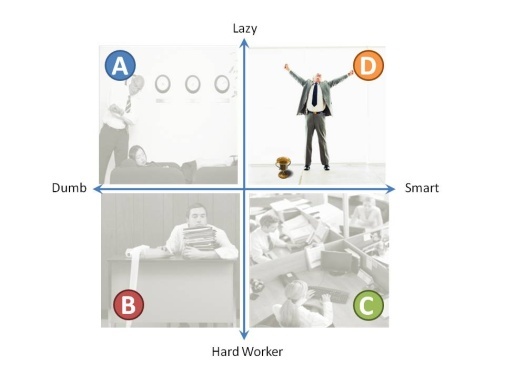 The people residing on this quadrant are going to create headaches and inefficiencies that will drag you group performance and quality of work. Because they are busy doing the wrong things they will create unnecessary fires, situations in which will require damage control. Also and unfortunately, they will put a strain to the rest of the group because they are going ending up doing the job for them. By having to clear up their messes, undoing the wrong and fixing it the good worker would not be able to spend time working on what matters and what was assigned to them. Work will take longer and deliverables might be put at risk because of this. 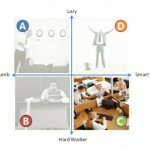 As different of the top left quadrant this are the people that you want to depart from. Either moving them out of your group (To a better role suited for them) and/or out of your organization or business. This is due to negative impact that keeping these individuals will cause in the long term to your group. You do not want a team that has anyone like this. The allowance number for this type of individuals is Zero. 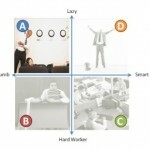 Now this next quadrant is your main quadrant. Here is where you find your working bees. 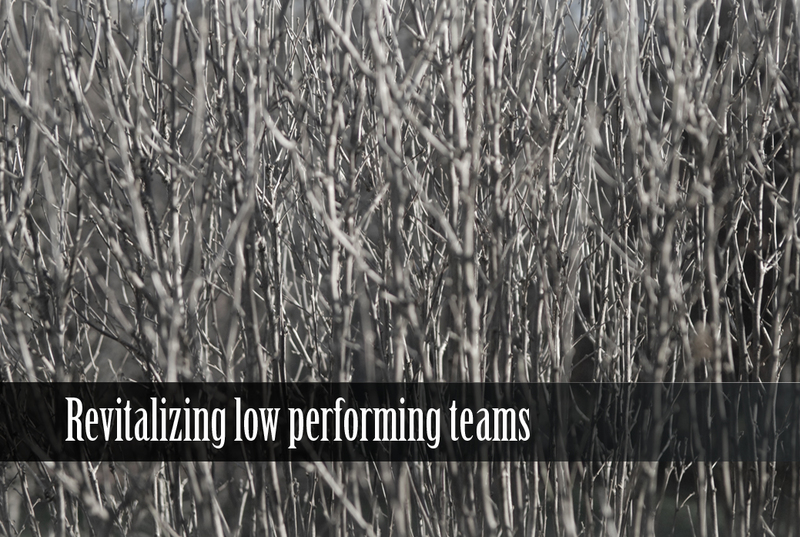 Here is the high performance of the high performance of the team. 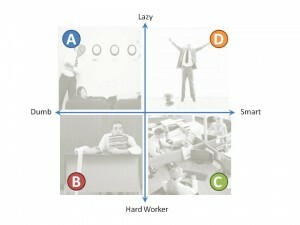 The people in this quadrant make things happens, they are smart and hard workers. You assigned work to this group and it gets done. They are achievers and always looking forward to find ways to contribute. You want to take care of this group. Give them a lot of TLC, they deserve it. Provide ways to keep them motivated. Find ways to enable training and professional growth. 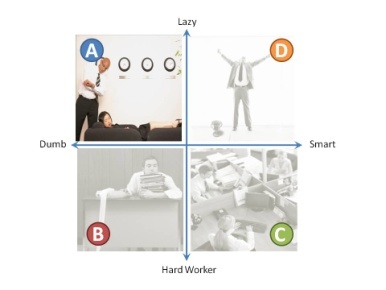 Listen to their needs and find ways to remove barriers that prevents them for doing the work (Like having people on the lower left quadrant near them.) 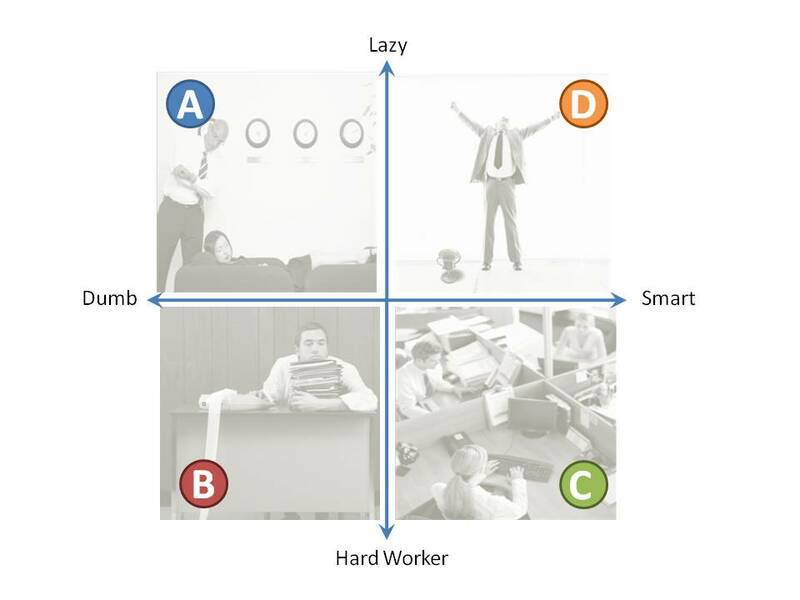 You should strive to have 80% to 85% of your group composition with team members in this lower right quadrant. Here is the other controversial group, the smart but lazy team members. The funny part is that I know you know someone that fits these criteria. These individuals are very creative and strategic in figuring out ways to get the job done as long as they can minimize the actual work or doing to get the job done. They will find ways to delegate the work to others in your team and outside the group/organization. They will look for ways to find efficiencies, cut out waste and strategically put themselves in a position of just tracking that the work gets done. They will look around to delegate, transfer and without hesitation will feel confident that the work will get done and take credit for it. Indeed, this is your management potential. They are charismatic and great influencers that will convince others that the work is important and needs to get done. They will most likely have a vast network; will understand ins and outs of the organization. They aren’t afraid to drop a few names here and there to let you know they the who’s who in the organization. The best way to handle these individuals is to get them ready to promote to managements role. Since they look for ways to improve and take advantage of the existing system you will learn a few thing that you can put in place or leverage. Their network is also part of your network. Since you are already in management it is most likely you will share a few similar traits too. What it is interesting to me about this management model is that it does take in consideration two aspects that rarely gets mention on management books; 1) The reality that medium and large organization are going to have a force a performance rating distribution that is going to force behavior. If that is the case, you need to strategize one way or another, from the beginning and keep that in mind while managing the group. 2) Your succession pipeline and management material that can be develop, nurture and promote not necessary come from the usual suspects. My take on this is that even though many managers pursue a similar approach I want to be a believer that if you as a manager have a top performer group, compose with top of the crème individuals, there is no reason to have anyone in the lower rating/ranking, even if the organization forces a distribution. One key element is that the distribution is held true (or force) with a certain minimal amount of team members, this being 50 or more in most cases. And like mentioned before if you strategize for a force distribution to conform to it, you can also strategize to not to conform the force distribution. This will required to take on challenging project, high visibility programs and a complex but highly effective communication strategy. Of course it is a risky move and the safe thing if to conform and follow the untold model/strategy. I will argue that you will be a better manager if you are able year after year manage to reward your team by not having any low performer selected (because there is none) and providing them with the right projects, challenges and contribution to the bottom line. This will include proactively promoting their work, value and contribution throughout the management chain. Since other managers will follow to manage conforming to the rating/ranking process you need to understand their weak links and without any doubt add higher value to the business than other groups in the organization.